This upper-intermediate ESL lesson plan is the second of three lessons on the theme of 'profession'. It contains activities, games and resources for teaching English students how to write a cover letter for a resume. 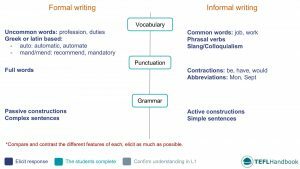 Compare and contrast the characteristics of formal and informal writing with your students and try to elicit examples of each point. Students review the function and purpose of a CV cover letter before writing one for themselves. Personal profile, education, work experience, skills, interests, references. Next, discuss the type of information contained in each section. For adult classes, draw on the students' experiences and talk about the expectations and structure of a CV as it relates to their culture. For less experienced groups, discuss what they think each section contains. 1. To secure a job interview. 2. To convince the employer to read your CV. Tell your students that for their next activity, they will be writing a cover letter. 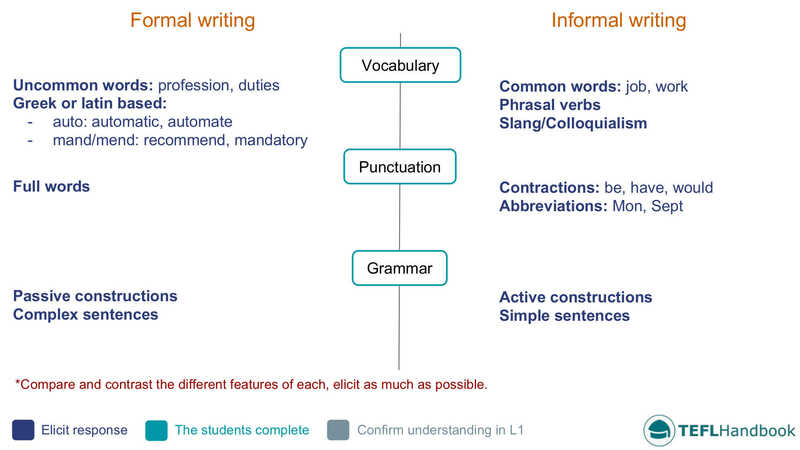 Try to elicit as much as possible of the following structure and add it to the board for your students to copy. Dear [Mr./Mrs./Ms. ___ ] or [Sir/Madam] when we don't know who we are addressing. Who you are and what you are currently doing. Why you are perfect for this job. Thank the reader. Call to action: Request an interview or follow-up phone call. Students will work in groups to create cover letters for some unusual positions. Start by discussing the following genuine job titles and the required skills and experience needed for each. After that, assign each one to a group and have them write the perfect cover letter. Dog surfing instructor: People you pay to teach you and your dog to surf. Professional cuddlers: Can charge up to $80 an hour to snuggle with strangers. Dog food taster: Hired by pet food companies to test the quality of their products. They usually spit out the food once they taste it. Fortune cookie writer: Fortune cookie manufacturers usually hire freelancers or in-house writers to come up with inspiring or witty fortunes. These people typically make around $40k a year. Students have to summarise an article related to a peculiar occupation. Students must find an article profiling someone who has an unusual job. They should write a summary of the article and prepare to answer questions on it during the next lesson. We hope that you found a few of these ideas useful. Our next free lesson in this series is a discussion on current social issues. Also, Be sure to bookmark our complete list of upper-intermediate level ESL lesson plans, as well as our entire collection of ESL courses. If you use an iOS or Android device, try out the TEFL Handbook app. An ESL lesson planner for English teachers. It has a lot more content and gives you faster access to our ESL resources, making it easier to use in class.